This book examines the terrorist networks that operate globally and analyses the long-term future of terrorism and terrorist-backed insurgencies. Terrorism remains a serious problem for the international community. The global picture does not indicate that the ‘war on terror’, which President George W. Bush declared in the wake of the 9/11 attacks, has been won. On the other hand it would be incorrect to assume that Al Qaeda, its affiliates and other jihadi groups have won their so-called ‘holy war’ against the Coalition against Terrorism formed after 9/11. This new edition gives more attention to the political and strategic impact of modern transnational terrorism, the need for maximum international cooperation by law-abiding states to counter not only direct threats to the safety and security of their own citizens but also to preserve international peace and security through strengthening counter-proliferation and cooperative threat reduction (CTR). 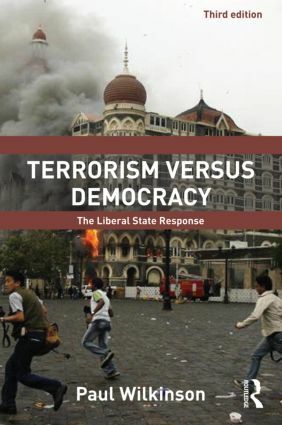 This book is essential reading for undergraduate and postgraduate students of terrorism studies, political science and international relations, as well as for policy makers and journalists. Paul Wilkinson is Emeritus Professor of International Relations and Chairman of the Advisory Board of the Centre for the Study of Terrorism and Political Violence (CSTPV) at the University of St Andrews. He is author of several books on terrorism issues and was co-founder of the leading international journal, Terrorism and Political Violence.